Mulled wine is a traditional part of the holiday season. A centuries-old warm punch, it's a favorite in many European countries throughout winter. Since each area has their own spin on it, there are many recipes to explore. 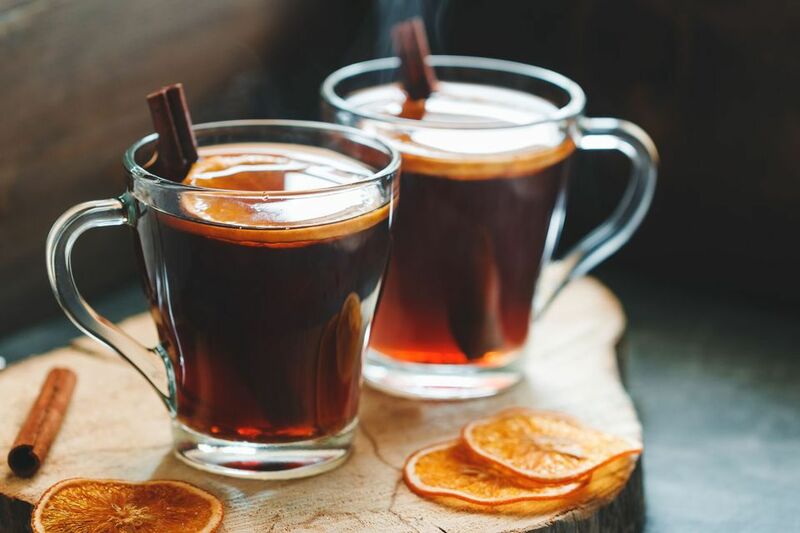 Depending on the country, you'll find these recipes by various names—glühwein, glögg, vin chaud, bischopswijn—but mulled wines share a common characteristic that's perfect for any holiday gathering: they all feature red wine steeped in a mix of warming winter spices. In Germany, mulled wine is called glühwein, which is often translated to "glowing wine." While the German and Austrian recipes will vary as much as any other, this basic recipe is a good place to begin. It pairs red wine with brown sugar and the usual winter spices (cloves, star anise, and cinnamon.) Juniper berries and cardamom are optional, but make a very nice addition if you have them. 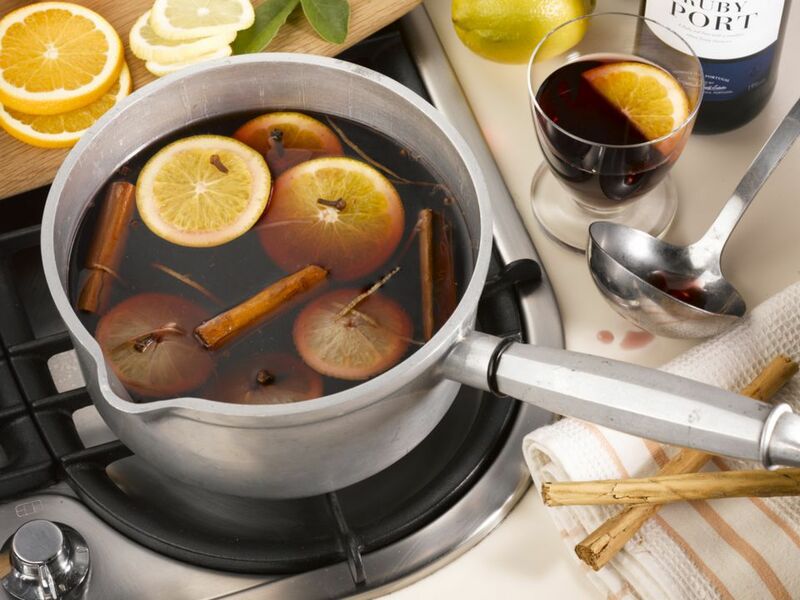 When it comes to warming up any mulled wine, you can use a large pot on the stove or your slow cooker. This easy recipe was designed for the latter and will be ready for guests in a couple hours. The aromatic brew is infused with nutmeg as well as orange peels and sweetened with corn syrup. The Italian version of mulled wine is called vin brûlé, meaning "burnt wine." It's another recipe that can be customized as you see fit, though the lemon zest, orange juice, vanilla, peppercorns, and bay leaves pair wonderfully with the traditional mulling spices. Grzaniec galicyjski is the Polish version and it's surprisingly simple compared to other recipes. If you're looking for a paired-down mulled wine, all you really need is a bottle of vino, sugar, cloves, cinnamon, and a bay leaf. It's fantastic and sure to keep drinkers cozy on cold nights. The French twist includes cognac, of course! Known as vin chaud, it is a very popular warm drink in France. This recipe—with its cinnamon, cardamom, cloves, and orange zest—deserves a good young red wine you wouldn't mind drinking on its own. Another traditional take on mulled wine, this recipe takes a slightly different approach. It adds brandy, uses honey for the sweetener, and pairs the cloves and cinnamon with ginger. Sliced oranges bring in a citrus accent that's perfect for complementing your favorite bottle of red. The Dutch call this warm punch bischopswijn, or "bishop's wine." It's another of the simpler mulled wine mixes, featuring a hefty amount of cloves and cinnamon sticks with both oranges and lemons. Things get a little more interesting in the Swedish glögg. This traditional recipe brings raisins and almonds into the mix, along with cardamom, ginger, cinnamon, and clove. If you like, add whiskey or vodka to give it an extra kick. If you are looking for inspiration on how to transform a traditional recipe into your own creation, the Smörgas Chef's take on glögg is a great choice. This one adds water, brandy or spiced rum, and vodka, as well as brown sugar and vanilla. It creates an intoxicating flavor that everyone is sure to love. This Mulled Pomegranate Warmer introduces a tasty fruitiness to the traditional punch. To make it, you'll add Pama (a pomegranate liqueur) to the citrus-spice mix. It's a perfect addition that is offset brilliantly by the nutmeg, cloves, and cinnamon. This ​mulled sangria takes a different approach than most mulled wines by adding Jägermeister to the red wine-pomegranate mix. The liqueur lends a nice herbal flare to the punch and it's fabulous with a little cranberry and club soda. Like any good sangria, it requires you to mix the wine, liqueurs, and fruit ahead of time to let the flavors marry properly. It's best when left to sit for a few days, so plan ahead! For a drink that's completely unique, the Mulled Spice Cheribundi is the ideal recipe. Instead of cranberry or pomegranate, this recipe opts for cherries and skips the wine altogether. Bourbon and cherry juice are the stars of the warm punch and they're accented with three basic mulling spices. It also include a small amount of root beer, which is unbelievably delicious under heat! Mulling spices are also found in many wassail recipes. This Christmas classic is just as much a tradition as mulled wine and the two punches share similarities. Like mulled wine, wassail can be made in various ways. One of the most popular is a brandy and dry sherry accented with mulling spices. The biggest difference in this particular wassail recipe is the addition of eggs, which give it a luscious mouthfeel that has a distinct old-timey holiday charm. Though mulled wines include, well, wine, you can skip the alcohol completely and still enjoy the comforting taste of the mulling spices. It's ideal for a family gathering and ensures everyone gets to enjoy a hot punch. The most popular way to do this is to make a drink that uses apple cider as the base. However, you can add the mulling mix to flavor a variety of fruit juices. One of the best alternatives to get the same deep red color is a blend of cranberry and pomegranate.